Can acidic foods increase the amount of stomach acids? All of us know that our stomach produces hydrochloric acid that helps in breaking down food for digestion. Most of us also avoid acidic foods like citrus fruits or coffee thinking that it increases the amount of gastric acids, worsening our acidity problem. 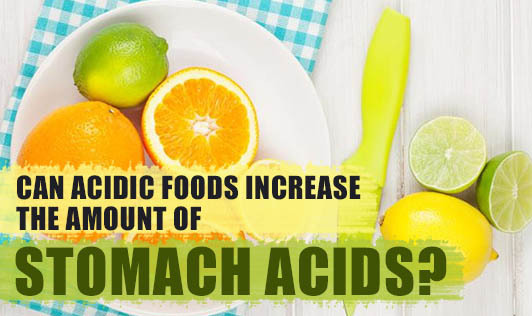 A new study suggests that acidic foods can increase the acid sensation in your stomach but not increase the amount of acid produced. Just a brush up on our secondary school Chemistry lessons will tell us that, acid levels are measured using a pH scale wherein, 7 is neutral, below 7 is acidic, and the concentration of acid decreases after a pH value of 7. The acid produced in our stomach has a pH of 2. Even highly acidic foods like lime and vinegar has a pH of 2 to 3. This clearly explains that acidic foods will not increase the amount of acid levels in your stomach. Though acidic foods like caffeine, chocolate, carbonated beverages, citrus fruits, tomatoes, processed foods, and fried foods though don't increase the amount of acid in your stomach, they can still harm the esophagus lining that is not as protected as the lining of your stomach. It can also increase the acid reflux into your esophagus. Dietary modifications can only reduce the symptoms of acid reflux, but a medical intervention is needed to treat the same depending on the degree of severity of the gastro-intestinal disease.